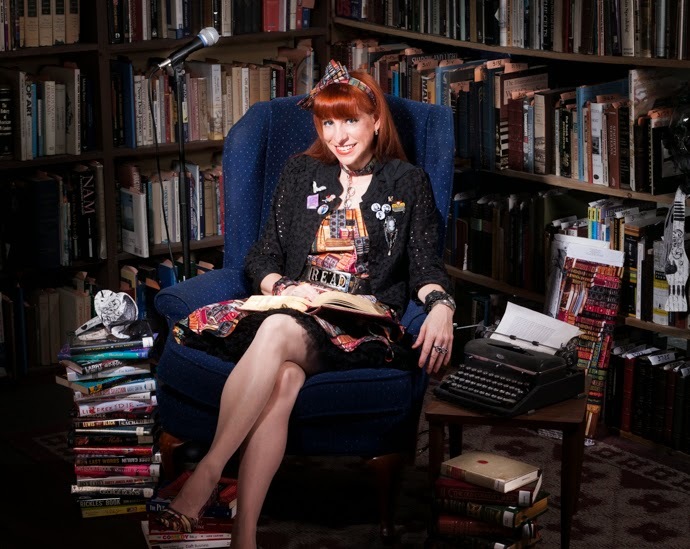 Meredith Myers, the “Stand-Up Librarian,” has a Masters degree in Library and Information Sciences from the University of South Florida and has been performing stand-up comedy since 2002 after checking out a comedy book from her local library. Binding her experiences in comedy and libraries, Meredith created www.StandUpLibrarian.com in June of 2010 to educate and entertain people about the importance of libraries and literacy through literary comedy shows and parody songs, hosting and promoting literary events, conducting interviews with authors and library personnel, and visits to unique libraries and literary landmarks across the country. In 2012, she launched www.StandUpLibrarianDesigns.com so she would have something literary fabulous to wear. In just two years, her line of literary accessories has grown to include purses, cosmetic bags, fanny packs, bow ties and hats - all inspired by her favorite books and authors. 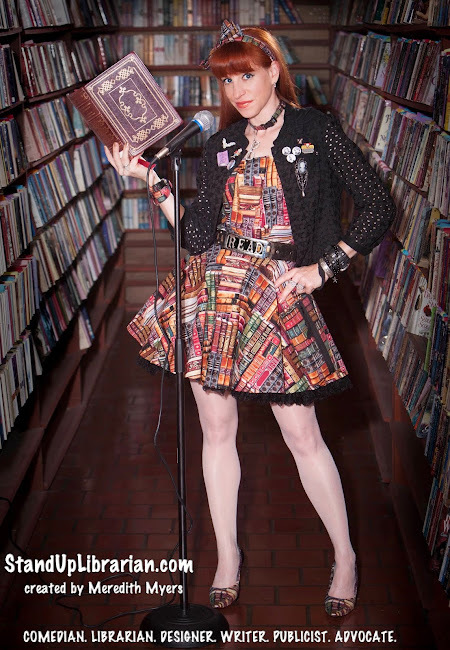 A combination of Pippi Longstocking and Sandra Bernhard with the style of Carrie Bradshaw, Meredith performs at library and book events across the country. As a comedian, Meredith has performed at comedy clubs throughout New York, Los Angeles, and the Tampa Bay area including Comic Strip Live!, Gotham Comedy Club, Stand-Up NY, The Laugh Factory, The Comedy Store, The Improv, Coconut's Comedy Club, American Stage and Venue Theatre. In 2003, she wrote, produced, and starred in her one-woman show Like a Publicist off-off Broadway, which received rave reviews and was based on her years in public relations, where she worked with Tupperware, 3M, Major League Soccer, Diana Krall, Kelis, Billy Gilman, Whitney Houston, Tommy Lee, Hugh Jackman, Roberto Benigni, Jeremy Renner, fashion designers, movie studios, music labels, television networks, authors and lifestyle accounts. With a public relations and marketing career spanning over fifteen years, Meredith continues to make herself available as a freelance PR consultant - especially for those promoting literacy. Meredith has appeared in various films and TV shows but her first national television appearance was a result of a PR stunt that required she wave a yellow cleaning cloth at Al Roker during his weather segment on “The Today Show.” She has since graced the cover of Tampa Bay's tbt*, and been featured in The New York Times, The New York Post, Newsday, The Village Voice, The San Francisco Chronicle, The Boston Herald, The Los Angeles Times, The Tampa Tribune, The Tampa Bay Times, Marie Claire, New York magazine, American Libraries Direct and Backstage. She has also been interviewed on WFLA’s “Daytime”, “NewsChannel 8,” CNN, “The Early Show,” VH1, and NPR. Meredith is a fifth-generation native of St. Petersburg, FL and enjoys collecting seashells and baking book cakes when she's not writing, performing, sewing or spending time at her local public library. Her favorite book is The Alchemist by Paulo Coelho and highly recommends dancing on a book cart to Madonna.